Last December 27th, I woke up having the crazy urges to get as much Starbucks Mugs as I possibly can. Well I have to confess that Collecting is really one of my addictions in life, once I want something I have to get it right away, fast, if possible. And in the morning my dad said that he can't promise me but he is planning for us to have dinner at Tagaytay. My thoughts lit up and suddenly I remembered that Tagaytay has a Starbucks GI Mug! So at lunch time, I asked my dad if ever the plans are still on the move but since my Yeya is not around at the house and will not be home overnight, we can't leave the house for dinner. I was quite sad and told him about the Starbucks mug and then he said Ok, we'll leave at 1 pm and I was ECSTATIC! So at 1 pm, we rode the truck all the way upland to Tagaytay. 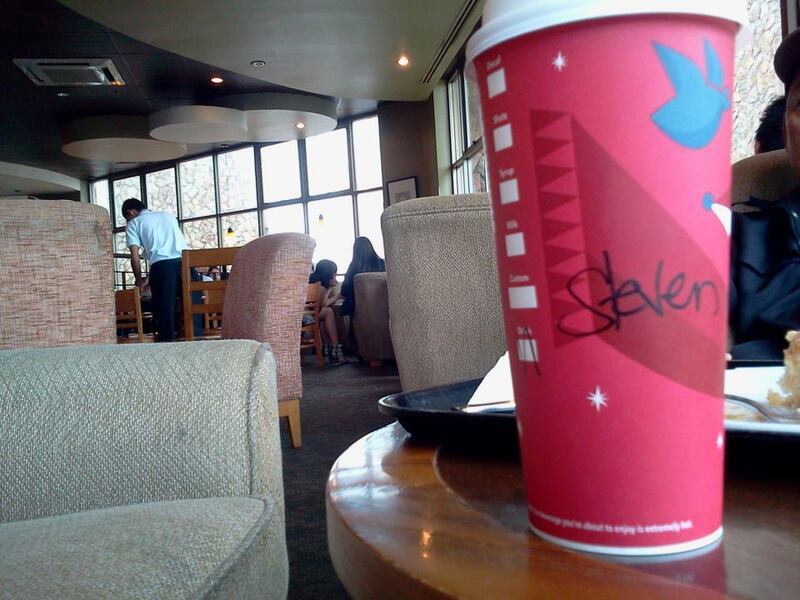 We drove slowly savoring the cool mountain air until we reached Starbucks Robinson's Tagaytay. There are only two Starbucks branches in the city but this one has lesser people so we stopped there. PS the focus were on the chairs not on the cup HAHA EXCUSES! Unfortunately, Very unfortunately, only the Philippines Mug were on display and no signs of Tagaytay Mug were there but still I was hopeful maybe they have some stocks kept. But when I asked the Kuya barista, he checked and it was confirmed, No Starbucks tagaytay Mug for me on that store! Oh bummer! I just got dad a Grande Cafe Mocha and a Cinnamon swirl and I asked him if we could visit the other Starbucks at Magallanes and the supportive dad he is, of course he agreed! So we buckled up and went straight to the Starbucks overlooking the beautiful Taal Lake. I was praying so hard that may this be it so that my dad's efforts for me to grab this mug will not be gone to waste. So we went inside, THE QUEUE WAS SOOOO LONG, but I did not care because you know what? They do have the Tagaytay Mug! There were actually around ten on display so I grabbed one for me and dad asked me to buy one for his boss and then my journey through the long line began. I was literally at the door and after a few minutes, my dad came zooming by and got the mugs from my hand and asked to follow me. I was so nervous! WHAT'S MY DAD UP TO! But then when we got to the other side of the store, where the baristas are calling names and serving the drinks, I realized that dad modestly asked the barista if we can skip through the line since we're just buying mugs and not drinks. Although it was quite rude for the people in line, it was quite understandable I guess since all we need are those mugs to be punched scanned and paid so there it was. 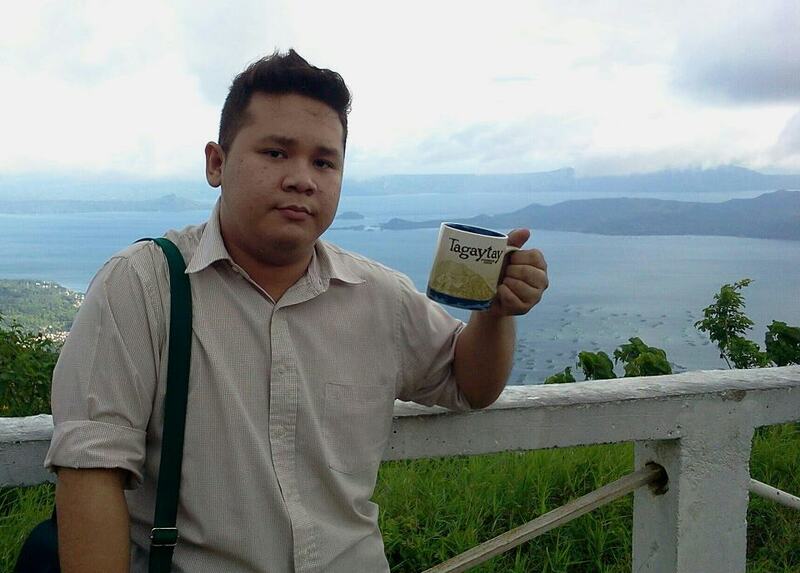 We thanked the kind lady barista and zoomed out of the store into the back where the beautiful Tagaytay Caldera and the Taal Volcano greeted us as if shouting CONGRATULATIONS ON YOUR THIRD MUG! 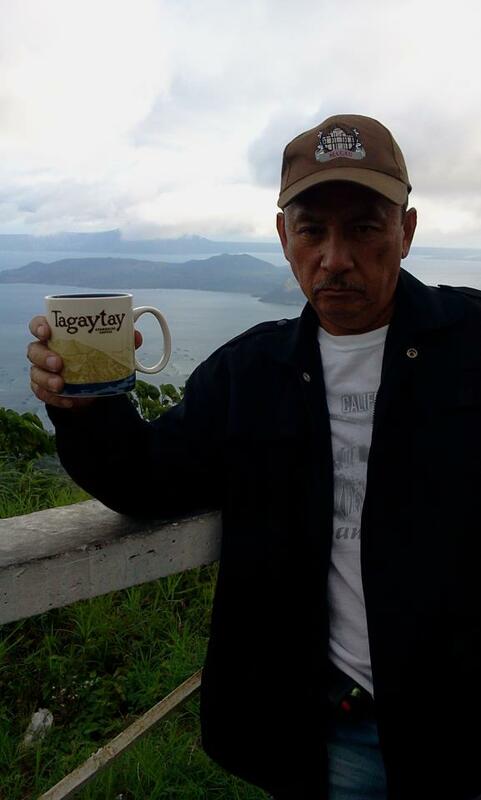 Me and my Tagayaty Mug! After all these things, I realize that this Starbucks Mug Collecting was truly challenging but will be a very good experience as I collect mug after mug just like what my American Friend Leif Hagen told me "Enjoy the journey!" when I posted my photo of me and the mug. I realized that as a traveler, you don;t just buy the things to add them up to your collection because it comes with the experience, a journey to get these things and make them your treasures. but thank you so much for being a very supportive Dad! Thank you so much Dad for always being supportive as you can with all my collections and even with my dreams. You are always a blessing to me. God Bless you more and may you live a long life so you can also enjoy everything that I will earn and learn as I trudge through this life. 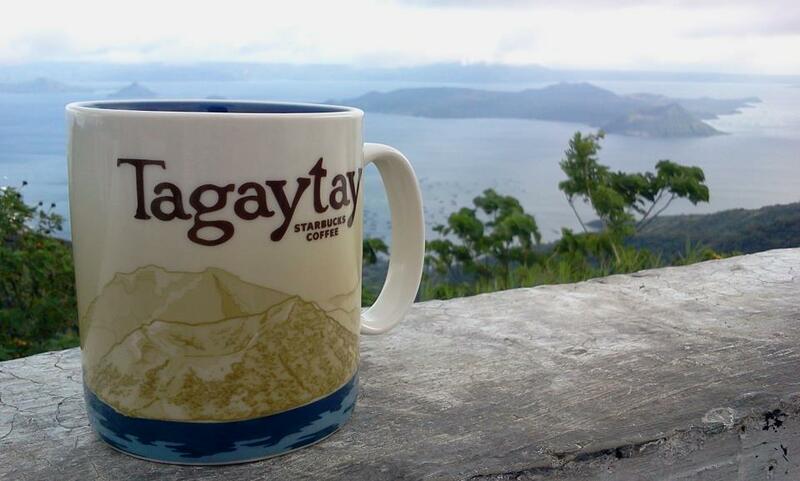 The STARBUCKS TAGAYTAY mug features the beautiful Taal Volcano on the front and the Taal Lake at the back of the Mug.